Been diving in Mandolin Point? Please Vote! 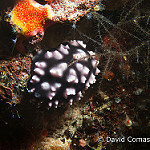 It has been said that this site is named because of the large numbers of long whip coral in the sloping wall that resemble the strings of a Mandolin. Regardless of the reason behind the name, this outstanding site is definitely worth a visit. 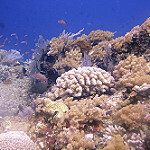 Like other Bunaken sites, strong currents bring in pelagic fish and large schools of smaller reef fish. 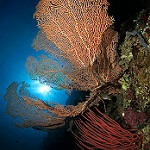 Amongst the site, there are large gorgonian fans, black coral, giant barrel sponges and some areas of soft coral. 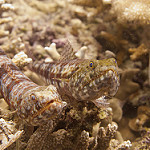 Within the long whip coral, there are many invertebrates to discover, and whip gobies, porcelain crabs, flat worms, and commensal shrimps to keep you entertained. 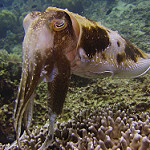 Divers can scout for moray eels, turtles, scorpion fish, leaf fish, and nudibranchs. Given the large numbers of wonderful sea fans, it is likely that some pygmy seahorses can be spotted. There are large schools of black snapper, pyramid butterfly fish and fusiliers taking advantage of the nutrients in the current. There are also many varieties of angelfish at this site. Larger fish include reef sharks, napoleon wrasse, turtles and dogtooth tuna. Trevally, barracuda, bump head parrotfish, Maori wrasse, and mappa pufferfish also join in the melee. Another highlight of this dive site is a small cave at around 35 metres. This is home to a group of black tip reef sharks that can be found sleeping in the cave. It has been said that this site is named because of the large numbers of long whip coral in the sloping wall that resemble the strings of a Mandolin. Map of Bunaken, Mandolin Point dive site.